Mining Historical Heritage is part of the Tentative list of Spain in order to qualify for inclusion in the World Heritage List. From the heaps of places that are trying to inscribe I visited La Union near Murcia. The first sights I saw were the typical rundown, forgotten and left behind buildings of a mining landscape. I knew I was at the right place. 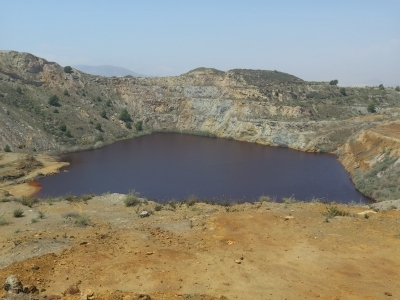 The first stop was at El Rojo, a lake now so red from the acid resulting from the mining. This isn't a tourist spot and the lookout even had a big no parking notice plus the typical danger sign, but it was only a few meters to get a good view. This all wasn't so much to see so there was surely something they are trying to inscribe? It's a landscape so you get a lot of buildings. Go into the town proper and you can find the old market, a pretty building, and a few casas & villas from former head honchos in the mining industry. I wasn't all impressed but it didn't take much of my time. I can't speak for all the heritage sites but this seems more of a national importance rather than a worldly one.